Placement visits have their perks. They take you places, both literally and metaphorically. Today’s visit was at the London Symphony Orchestra (LSO), at the Barbican Centre in the heart of the City of London. My usual 40 minute train journey into London Waterloo, followed by a shorter journey on the tube to reach Barbican on the Metropolitan line, wasn’t anything too arduous. Silk Street and the surrounding area, where the Barbican Centre is located, is a place I am already pretty familiar with from my student days in London. Coming here again brings back many happy reminiscences; meetings with friends, purchases from the small quirky music shop on the corner that still looks the same, and memorable concert evenings at the Barbican. A distinctive feature of the London skyline, the Barbican’s imposing architecture engulfs a cultural oasis for the arts. Inside this maze-like multi-storey building lies a feast for the senses. The Barbican Centre is one of Europe’s largest multi-arts venues hosting an impressive range of events; art, theatre, music, film, dance and creative learning activities. From classical music concerts by renowned musicians to sonic art installations, dance performance exhibitions, sci-fi film screenings in the first-of-its-kind outdoor cinema, and experimental works that promise artistic journeys into the realm of the extraordinary. Music students who work as interns for one of the LSO’s departments are surrounded by all this vibrant culture and access to events, with many music concerts for free, is literally at their door step. The LSO, originally formed in 1904, has been the resident orchestra at the Barbican since its opening in 1982. It gives a large number of concerts, of both classical and contemporary music, at the Barbican and on tour worldwide. The LSO also programmes innovative workshops and concerts through its community and education department, LSO Discovery. Its mission is to bring music to the greatest number of people and serve the public. LSO Discovery offers a training placement that has traditionally been taken up by a University of Surrey Music undergraduate. This year’s intern, Alan Read (Music BMus), has been actively involved in a range of impressive activities for various Discovery projects, including organising and running school Gamelan workshops, numerous sessions with LSO Discovery choirs and more recently the rehearsals and performance of Andrew Norman’s opera A Trip to the Moon. The July performance, conducted by Sir Simon Rattle, marked the UK premiere of Norman’s opera; a work inspired by the 1902 French silent film with the same title (Le Voyage dans la Lune) by Georges Méliès. The opera brings together onstage children’s and amateur choirs with professional opera singers in a spectacular musical phantasmagoria about lunar encounters. During their professional training year, students on placement will be visited three times by their designated placement tutor: early on, around the middle, and towards the end of their placement. Today’s visit was the third, and final, one at LSO Discovery. So, what happens at these visits, what is the role of the tutor and what can students on placement expect to gain from these sessions? Although there is a recommended format that is usually followed, what’s for sure is that no placement visit is exactly the same. Each opportunity to meet with the students, at different stages of their professional training, provides a rather unique experience of learning and reflection. The purpose of these visits is to have an informal discussion with the student and their line manager or supervisor, about how things are going. Besides identifying opportunities for further personal and professional development within the role, the placement visit offers a chance to reflect. Reflection is integral to the learning process which in turn implies a process of change and transformation through agency. The role of reflective observation has been theorised in David Kolb’s influential Learning Cycle (1984), which the diagram below adapts and illustrates with a plausible scenario about organising music rehearsals. Just carrying out a task is seldom enough to learn something new. Instead, an experience has the capacity to yield learning when it involves the key elements of reflecting, interpreting, and testing our interpretations in subsequent actions we take. 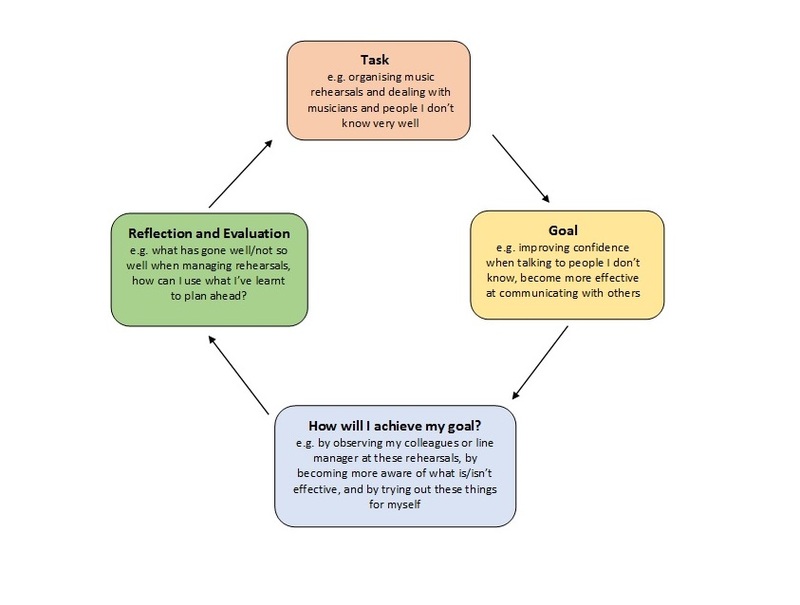 Obviously, learning through reflecting on our experiences cannot always be compartmentalised neatly into the boxes of a flow chart, but we all, more or less, engage in some form of reflection, implicitly or explicitly, which enhances learning. Reflective practice is also important for the tutor to engage in. Reflecting on ourselves as tutors, on the passionate and discerning personal involvement during placement visits, offers a legitimate source of experiential knowledge about better understanding and supporting our students’ learning and development. Kolb, D. A. (1984). Experiential Learning: Experience as the Source of Learning and Development (Englewood Cliffs, NJ: Prentice Hall).